This steel comb fur remover gently removes shedding hair and dander from your pet’s coat. The oval poplar wood handle fits comfortably in your hand and the comb’s teeth grab loose hair from the tips, not the base, to make for a more pleasant grooming experience for your pet (and you). Made in the USA and made for a lifetime, this tool can also be used to clean up hair from upholstery, carpets, and your pet’s bed, too. Dimensions: Small: 2.5" x 2.75" x 1.5"; Medium: 5" x 2.75" x 1.5"; Large: 10" x 2.75" x 1.5"
Weight: Small: 0.19 lb. ; Medium: 0.31 lb. ; Large: 0.63 lb. Wonderful for me and my cat! This comb was the best gift I ever bought for my cat. It definitely works just as described. Removes all of the loose hair and is very cat friendly. 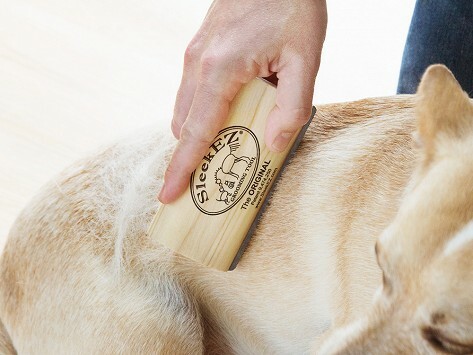 Made in Montana and guaranteed to last a lifetime, the SleekEZ fur remover was created by Jennifer Tipton—someone who knows a thing or two about caring for animals. Jennifer is an equine dentist who was faced with loose horse hair getting in the way while she was trying to focus on the animal’s teeth. She created a prototype comb to curb those flyaways and horse owners responded so positively that Jennifer quickly realized other pets—like cats and dogs—would also benefit from her unique grooming tool. SleekEZ is the result of her hard work to perfect the poplar wood handle and patented steel comb design. The comb’s teeth gently grab loose, shedding hair, dander, and dirt from not only a pet’s coat, but also from rugs and upholstery. Because the teeth grab loose hair at the tips and not the base, SleekEZ is less irritating to pets, resulting in a more relaxed grooming experience for everyone involved.